Workers at Yakult only want modest increases of 3% at a time when Yakult announced a $332 million profit for 2017. Australia has been identified in their annual report as a high growth region, yet the company are refusing to give workers a fair share of the profits. "Workers need higher wages. 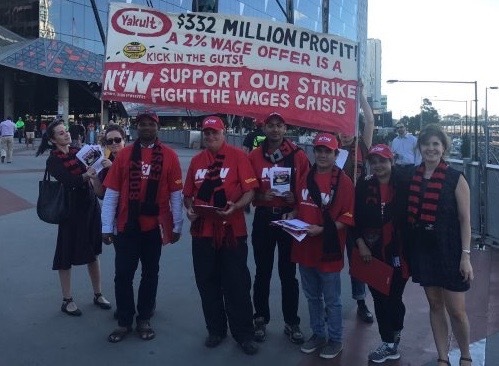 The national conversation in Australia is on how we lift wages, and union members know that it is by taking action, because companies like Yakult do not want to pay their workers fairly" said NUW Assistant Victorian Secretary Susie Allison. "Every worker counts, and deserves a pay rise." Yakult is a sponsor of the Aussie Rules football team Essendon,and workers and their union took their message pre- match to football fans at Docklands Stadium in Melbourne.